Posted on January 15, 2014 by Ronald Patrick Raab, C.S.C. I just received copies of my new book from World Library Publications in Chicago. 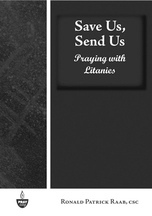 The book, “Save Us, Send Us: Praying with Litanies” was written while I was serving at Saint Andre Bessette Church in Portland, Oregon. To order the book, CLICK HERE. Here is a sample litany from the book: To read more sample pages, CLICK HERE. (Matthew 6:31–34) Response: You know well what I need, O God. This entry was posted in Blog Posts, Other publications by Ronald Patrick Raab, C.S.C.. Bookmark the permalink.